❤ AS SOFT AS YOUR BABY’S TOUCH: M&Y crib sheets can only be compared to the smoothness of your baby’s skin. This hypoallergenic jersey knit cotton is by far the softest, coziest and most breathable fabric. 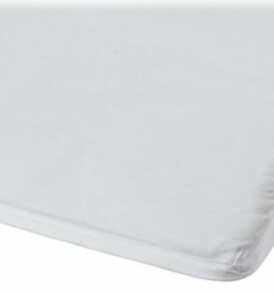 ❤ SECURE FIT AND FREE FROM HARMFUL CHEMICALS: M&Y’s 28x52x9 inch crib sheets are stretchy and fit snugly around any standard crib/toddler mattress. They are free from harmful chemicals and easy to put in place due to the high-quality elastic band. ❤ RISK-FREE – 100% MONEY BACK GUARANTEE: There is no risk for you. At M&Y we design baby products of highest quality. If you experience ANY problems with your M&Y Crib Sheets we refund your purchase – no questions asked. M&Y Fitted Crib Sheets are heavenly soft and provide your baby with the comfort and security she/he deserves! M&Y Crib Sheets are made from breathable 100% jersey knit cotton. They are the softest you can find and they provide your baby the comfort for a restful sleep. Deep 9-inch pockets with elastic all around the bottom of the sheet ensure a snug and secure fit. These sheets fit standard size 28 inch x 52 inch crib and toddler mattresses. As a mother, going through hundreds of sheets for your baby is a given. Due to their high-quality elastic band these crib sheets are very easy to change. And to make sure you always have a spare sheet at hand, we put together a 3-pack for you. The material used is hypoallergenic and free from harmful chemicals. These crib sheets are premium quality, durable and long lasting. 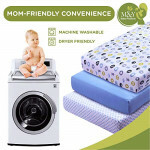 M&Y Crib Sheets are machine-washable and dryable. Machine wash cold and tumble dry low. M&Y baby crib sheets are the gift every mom will love for baby showers, birthdays, or Christmas. M&Y’s crib sheets make a perfect gift and arrive in premium packaging that looks great in a gift bag. These crib sheets fit any standard size crib mattress and standard toddler bed mattress. NO RISK – 100% MONEY BACK GUARANTEE: At M&Y we design baby products of highest quality. If you experience ANY problems with your M&Y Crib Sheets we refund your purchase with no questions asked. Brighten up your little one’s crib and create these tender moments with more hugs, cuddles, and giggles along the way! ORDER NOW RISK-FREE on the upper right! ❤ MACHINE-WASHABLE AND EXTREMELY DURABLE: Our crib sheets’ special elastic bands are durable and long lasting. These extra-soft sheets can be machine washed and put into the dryer as often as you need. ❤ THOUGHTFUL GIFT IDEA – MOMS LOVE THEM: M&Y baby crib sheets are the gift every mom loves. Show your friends how much you care about them by getting them the perfect gift for their baby shower or birthday. And it’s a great item to put on your own baby registry, too.